It is a little weird to say that Sweet Mickey is now the president of Haiti. In respect for the presidency of this struggling country and in hopes that he is earnest in his efforts, I will come respectful and correct by saying Michel Martelly has been elected the new president of Haiti. I will admit that I was adamantly opposed this him running and his campaign all together as I was when Wyclef Jean attempted to have his name placed on the ballot. However, I am not dogmatic in my opinions on this matter so I was open for discussion. My reasons, I realize may have been somewhat elitist. I thought that their running made a mockery of the elections and was a joke. They had no formal training and no “official” political experience. What nerve did they have to run for such a high office? However, why not? Let’s face it, I think the presidency has already been made a mockery of enough with candidates that are supposedly qualified taking office and not doing anything to honestly effect positive change, while this Michel Martelly has lived there and actually took to political activism in a grassroots effort. So what he was in the entertainment industry? How many politicians in America came from the entertainment industry and decided they wanted to be in office and because they could afford to run a campaign they ran and won. Lastly and most importantly, isn’t this how the system was set up? Anyone who meets the qualifications to run can. In America, “No person except a natural born citizen, or a citizen of the United States, at the time of the adoption of this Constitution, shall be eligible to the office of President; neither shall any person be eligible to that office who shall not have attained to the age of thirty-five years, and been fourteen years a resident within the United States.” If anything Michel Martelly’s win should inspire younger folks to reach beyond the stars. 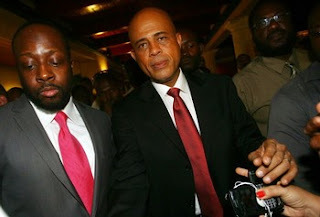 Michel Martelly cannot be any worse than the Haitian presidents that have come and gone. What is done is done. The people have spoken, so now it is time to stop fighting and come together to make things happen. I wish him phenomenal success, and I sincerely hope that his heart and effort are in earnest.